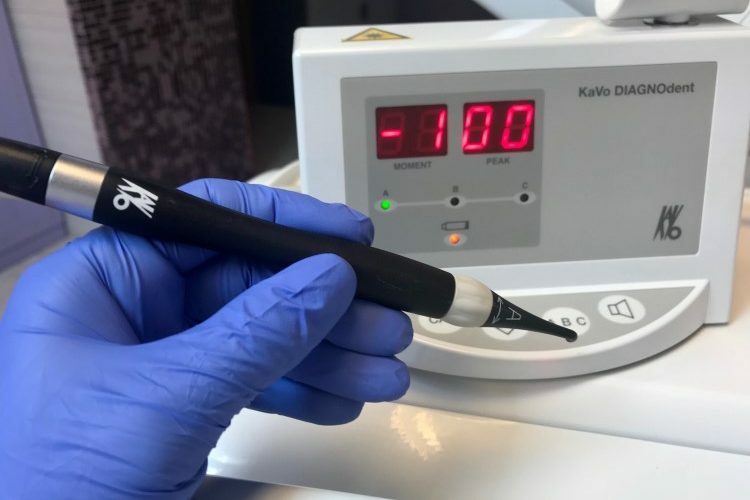 The use of DIAGNOdent pen 2190 has certain advantages during the minimal intrusive treatment (the smallest possible intervention in the tissue of the tooth; in some cases it is possible to treat tooth decay without drilling). It is possible to detect the changes which are still unnoticeable at the depth of 2 mm of the tooth tissue. When irradiated with light of a particular wavelength, the changed tooth substance (in the case of caries or inflammation of the nerve) radiates the fluorescent emissions. This radiation is recorded and analyzed by dìagnodentom. A certain light energy is brought through the light probe onto the surface of the tooth. A fluorescent glow would appear in case if there is pathology, such as dental decay, present. The type of the glow denotes a particular process with specific numeric indicators. The showings of DIAGNOdent pen 2190 do not have an absolute priority. In order to properly interpret the showings, it is important to take into account some personal risk factors that play the role in development of caries: caries anamnesis, frequency of sugar intake, presence of “carious” bacteria, salivating. The final diagnosis is based on the showings of DIAGNOdent pen 2190, along with the consideration of risk factors for caries. DIAGNOdent pen 2190 provides the perfect means for monitoring the pathogenic pathway. In many cases, when the accurate diagnosis cannot be established, the non-invasive (no drilling) treatment, such as fluoridation, laser treatment, ozone treatment – ozone therapy using the apparatus called KaVo HealOzone, is prescribed on the initial stages. The regular control allows you to monitor the development process. Irradiation of patients (radiation therapy). The teeth and dental gaps should be scrupulously dried before scanning, because saliva alters the direction of the beam, particularly on the approximal tooth surfaces. Вартість залежить від області застосування і вихідної проблеми. Детально дізнатися вартість і кількість необхідних процедур можна на безкоштовній консультації в центрі iStomatolog.